Our moderator Pavit got maximum votes and won the "Best Support Guy 2014" event along with $365 in cash and a cool profile badge. All who commented have got 1 month additional membership. 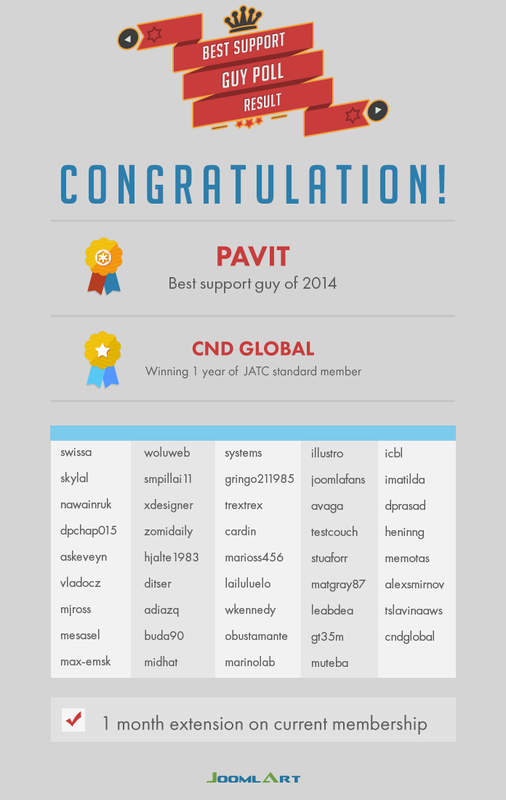 CNDGlobal was chosen randomly and he won 1 year JATC standard membership. "Great support team who've helped me find the obvious and the not so obvious solutions! Even when it's not really been a JA issue!" "Response in minutes, site up and running in no time. Membership has its privileges. Keep it up gentlemen, all year long. Kudos! Don't neglect your families going for the prize. " "Just wanted you guys to know that before I started using JA and the forums I could hardly write any CSS and now learning from the mods here I am quite confident to write CSS, PHP and HTML! Also the little tricks I've learned are awesome like copy as html, custom.css files to mention a couple, I am 100% JA for life!" "The good thing about this vote is that I seldom need support form JoomlArt. Templates and extensions usually do exactly what I expect 'out-of-the-box'. The last time I needed support was more than a year ago, and (I think) Tom provided answers. The answers solved my issue so, Tom gets my vote. Apologies If I am mistaken and have slighted anyone who deserves my vote, but that is the price you must pay for providing product that requires so little support." We would be making this event a regular one and will have more prizes and badges for participants.